His House > Blog > Addiction > Why is Sleep So Important During Addiction Treatment? Why is Sleep So Important During Addiction Treatment? It is not unusual for sleep patterns to change during drug and alcohol rehab as many addicts have a long history of using substances to help a good night’s sleep. It can be extremely detrimental to progress if a patient is battling with an inability to sleep, with negative health consequences that can easily hamper chances of successful recovery. The whole rehabilitation is designed to re-train the mind and body and an integral part of that is learning how to fall asleep naturally, without relying on substances to induce drowsiness. There are many more reasons why good quality sleep is beneficial in drug and alcohol rehab than many people realize. Some of the benefits can contribute significantly to progress in addiction treatment. Stress is a big factor in addiction and often it is the reason patients begin to self-medicate with drugs or alcohol when they first start using. For that reason, sleep can have enormously positive benefits in treatment programs, as addicts slowly begin to lose dependence on what was previously their stress-busing mechanism of choice. 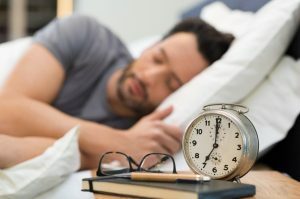 A good night’s sleep has a direct link with our cardiovascular health, as does stress and has been proven to reduce stress levels, allowing better control of blood pressure and leads to a calmer, less stressed patient which is essential to making good progress in addiction rehabilitation. Sleeping well contributes to our overall wellbeing and so it makes sense that not getting enough leads to irritability and even depression. Addicts who have been self-medicating with alcohol or drugs will know there is a direct link with depression and will more than likely display signs of underlying anxiety issues during rehabilitation. By ensuring at least 8 hours of deep sleep on a regular nightly basis, feelings of anxiety and depression can be lifted to such an extent that progress towards rehabilitation can be significantly boosted. Good sleep leads to better emotional stability, which is vital in addiction recovery programs. Although many think that driving under the influence of drugs or alcohol is the most common cause of fatal road traffic accidents, it is in fact lack of sleep, according to the National Highway Traffic Safety Administration. Sleeplessness affects decision-making and reaction time and is underestimated as a problem by many people. Lack of sleep can contribute to addiction issues, almost fuelling them to some extent through the increased anxiety and stress levels that generally impairs judgment, leading to poor choices. On the flip side, it’s clear to see just how beneficial a good night’s sleep can be, particularly in addiction treatment programs. The best quality sleep is achieved when it’s completely dark in the room, without any light beaming through curtains first thing in the morning, to achieve a refreshing and natural awakening. Avoiding drinks with caffeine before sleep is a given although even getting engrossed on social media can be sufficient to reenergize the mind, making sleep impossible. A deep aromatic soak in the bathtub is a good way of quieting the mind and relaxing the body before sleep. There’s little point fighting an inability to sleep and so it’s better to get out of bed and focus on something else rather than lying there waiting to drop off. No matter how difficult or frustrating lack of sleep can be, it’s crucial not to revert to old behaviors if in addiction treatment. Most drug and alcohol treatment centers include sleep therapy in addiction rehabilitation as it is one of the most important components of holistic and natural recovery. Sleep is the body’s only opportunity to regroup and regenerate and provides us with the fuel our minds need to deal with complex emotional, physical and psychological issues, providing the mental clarity that ensures successful addiction recovery.